It is more important than ever to deliver superior customer service at a reduced cost. In order to maintain your competitive edge, you need to accommodate your customers, trading partners, sales representatives and customer service in today's 24/7 marketplace. Automating your customer transactions and providing these functions during a wider range of hours increases top line revenue and decreases labor costs. About 75% of the work effort performed in a typical Customer Service department is generated through phone, fax and email orders and also from providing customers with order status and shipment tracking. 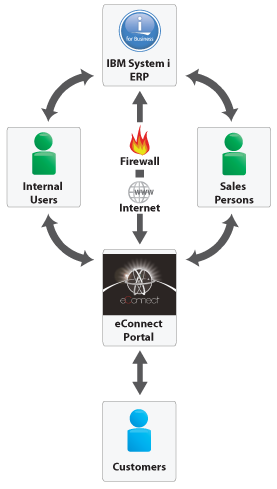 eConnect Customer Portal provides the opportunity to move those manual orders to an automated solution that is available during all hours your PRMS system is up and running. eConnect Customer Portal makes it simple for your customers to inquire on their past and current orders, when it's convenient for them, without having to place a phone call. We capture shipment tracking numbers at shipping time and integrate our solution with most major shipping carriers on-line tracking systems. Your customers can log into the portal, find their order and click on the link to track their package 24/7. Delivered by Datanational - Powered by IBM Datanational's eConnect Customer Portal is a Java-based eBusiness solution that can reside on one of your servers or on a web server that is hosted and managed around the clock by Datanational's technical support team. It is tightly integrated with your IBM System i (AS/400) ERP system, leveraging its existing centralized data source for all pertinent master files and customer order records. The front-end application can be implemented within the IBM WebSphere Application Server (or Tomcat) infrastructure right on the IBM PowerSystem i or another Wintel or Linux server.